In early December, the Teamwork Englewood office received an anonymous call from an affiliate of the Chicago Department of Public Health alerting them that the Englewood STI Specialty Clinic—one of four city-run clinics offering free testing and treatment for sexually transmitted infections—would be shutting down. On December 11, Nicole Johnson sent out an email to the neighborhood’s Health & Wellness Task Force, of which she is a member, outlining her concerns: that Englewood residents without health insurance would be left without reproductive healthcare; that walk-in treatment and testing for HIV and other STIs would cease to be available in the neighborhood; and that this marks a continuing trend of public disinvestment from Englewood. The city clinic, housed in the basement of 641 West 63rd Street in the same building as a University of Illinois-Chicago Mile Square Health Center and a Howard Brown Health Clinic, ceased operations on January 12. According to a CDPH spokesperson, federal funding cuts prompted the clinic’s closure. These cuts, paradoxically, resulted from Chicago’s recent success in HIV prevention and treatment. “This past year, the number of new HIV infections hit an all-time low for Chicago and we remain committed to completely eliminating HIV infections within the next ten years. […] Because of the progress we have made in achieving historic lows in new HIV infections, Chicago will receive less federal grant money in 2018,” the CDPH said in a statement. It’s true that new HIV diagnoses are at a record low in Chicago—just last month, Rahm Emanuel’s office announced that diagnoses are down fifty-five percent from 2001, and that eighty percent of those newly diagnosed are linked to medical care within a month. As the city released this data, Emanuel also announced Chicago’s participation in the international Fast-Track Cities initiative, becoming the fifteenth city in the United States working to hit the United Nations’ HIV eradication targets by 2020. Englewood would be an ideal locale for the mayor to bring his commitment to young Black men into practice. “We have high numbers of HIV incidence,” said Michelle Rashad, a chair of the Englewood Health & Wellness Task Force. She cites numbers from the Chicago Health Atlas: Englewood’s rate of HIV incidence (that is, the number of new cases identified in a year) is 50.7 per 100,000 in comparison to the Chicago average of 34.2 per 100,000. “So we know HIV is an issue. The fact that funding is being cut from it is shocking. It’s shocking especially because there’s always a need, but someone makes the decision that that need isn’t a priority and cuts the funding. That’s just very disheartening,” said Rashad. HIV—human immunodeficiency virus—has always been a disease of the marginalized in this country, a slow-building illness stigmatized and rendered invisible by interlocking prejudices surrounding queerness, poverty, and Blackness. Left untreated, HIV develops into AIDS: acquired immunodeficiency syndrome. AIDS prompts a failure of the human immune system, and, until recently, was a death sentence. With recent advancements in antiretroviral therapy and preventative care, AIDS is now a condition many people live with. The Center for Disease Control estimates that there are roughly 1.2 million people in the United States living with HIV. However, testing is critical: it must be treated early in order to be managed, and the CDC estimates that one-eighth of those 1.2 million are not aware that they are infected. To have HIV/AIDS is to become individually vulnerable to opportunistic infections, and to live in a community without adequate healthcare resources is to become collectively vulnerable. Two driving forces behind the dropping HIV rates in Chicago are both under threat by the current federal administration: the availability of a preventative pill called PrEP, which must be taken daily to maintain its effectiveness, and the Affordable Care Act. Since being signed into law in 2010, the ACA has allowed an estimated 12,000 Illinois residents living with HIV to access regular and affordable care. Without insurance, typical medical costs for yearly treatment range from $20,000 to $30,000. “Life happens, and people say, do I pay the rent, or do I pick up my medications? People start making choices,” David Ernesto Munar, president and CEO of Howard Brown, told the Chicago Tribune late last year. The Chicago Health Atlas estimates that twenty-two percent of Englewood residents are uninsured. There are two clinics remaining in the building on 63rd Street: Howard Brown and UIC Mile Square. The city says that these two will pick up the slack left by the closure of the city clinic, and Maya Green, site medical director of Howard Brown’s 63rd Street location, reports that they started providing walk-in services this month. “Approximately twenty to twenty-five walk-in patients a day were estimated by the city and we expect that we will absorb those in collaboration with our other partners in the building,” she said. “We anticipate being able to serve Englewood’s sexual health needs through our walk-in clinic, as we have an excellent history in Chicago of providing these services at our other North Side locations.” Both remaining clinics provide treatment on a sliding payment scale for uninsured visitors. 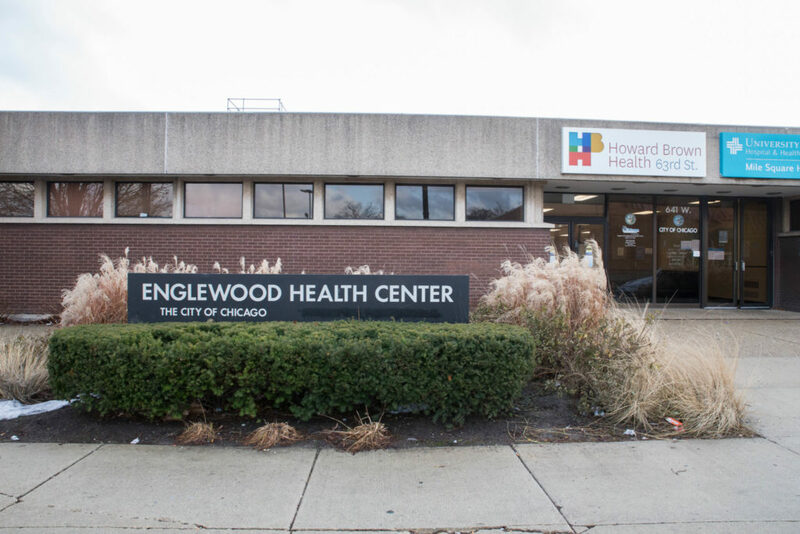 With the threat of dwindling public resources, the Englewood Health & Wellness Task Force is working on next steps, including a Health Navigators program that would help residents locate and use existing resources in the neighborhood. They continue to advocate for ample, affordable, and accessible care. Update (1/26/2018): After the publication of this article, the CDPH provided the following information: The Howard Brown and UIC Mile Square clinics are planning to increase their capacity in order to see 200 patients a day, though neither clinic is receiving new funding from the CDPH for their increased walk-in services. Bea Malsky works at Ci3, a public health research and policy lab with a focus on adolescent sexual and reproductive health. 6 alderman and nobody saw this coming…. Thank you so much for reporting on this! Very well written and so true! I will be writing grant proposal on HIV prevention in Southside of Chicago for class project.